Sweetened with the flavor of chocolate, a traditional Brandy Alexander makes a delicious after dinner drink. Make the shake version, and adults can practically substitute it for their dessert. 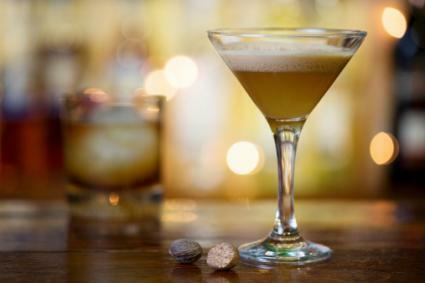 Although the Alexander cocktail was originally made with gin, the Brandy Alexander has far eclipsed the original in popularity. If you've never tried this drink before, you're in for a real treat. Pour the liquid ingredients into a shaker with ice and give them a quick shake. Garnish the cocktail with a little grated nutmeg. Fresh grated is always best, but you can sprinkle a little ground nutmeg on top if that's all you have. When the Brandy Alexander is made with ice cream instead of heavy cream or half and half, it's referred to as a shake. If you think the traditional version is smooth, you really have to try this version. Place the cup of ice cream in a blender. Pour in the brandy and créme de cacao. Blend on low speed just until smooth. Pour into a cocktail glass and garnish with a little nutmeg. 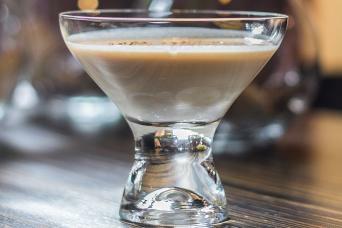 The creamy texture of these Brandy Alexander cocktails can be a little disarming, and you may be tempted to over imbibe. Take time to savor the flavor of your drink so you're not tempted to consume a few too many too quickly, or your cocktails may sneak up on you all at once.